We aim to make your stay in Hahndorf and the Adelaide Hills, rich with the finest local food, wine, and of course award-winning service. We promise that you will go home well rested and fed, with a smile upon your face. The Haus Group is a family of accommodation, event and conference spaces, and restaurant located on historic Main Street, Hahndorf – all only 20 minutes drive from Adelaide. Our guests can explore the Adelaide Hills, and base themselves in our idyllic world-famous village for day trips to Adelaide, beaches including Glenelg and Victor Harbor, and the nearby McLaren Vale, Langhorne Creek, and Barossa wine regions. 19 motel rooms set in a relaxed setting tucked back off the Main Street with an undercover swimming pool. Ideal as a base for exploring our beautiful Adelaide Hills region, or for long-term business stays. The leaves are changing in the Adelaide Hills and we are offering an Autumn Getaway Package from $164* per couple! The Hahndorf Accommodation Autumn Getaway Package includes one night’s accommodation, local handmade chocolate, a bottle of wine and a $30 breakfast voucher. Come and experience the colours and flavours of Hahndorf in the heart of the Adelaide Hills. *Package prices vary depending on accommodation property. The Haus is regional in focus, global in outlook, and local at heart. As one of the most recommended Adelaide restaurants, The Haus is open for breakfast, lunch and dinner 7 days a week. 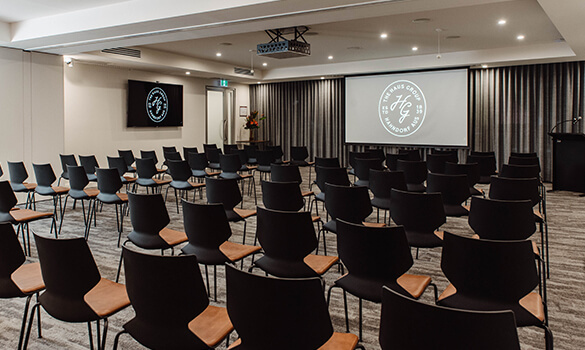 Only 20 minutes from the Adelaide CBD up the South-Eastern Freeway – you’ll feel as if you’re a world away when holding your Conference, Meeting, Event or Wedding with The Haus Group. POP UP and see our brand new state-of-the-art Conference & Events Centre. Awarded Best Venue Caterer at the 2018 South Australian Restaurant and Catering Awards of Excellence, The Catering Haus brings years of culinary and hospitality experience to the location of your choice. Would you like to receive the best deals on accommodation, dining and attractions that Hahndorf has to offer? "We celebrated our daughter's 21st at The Haus - WOW! A happy & positive experience from the get go. Friendly & helpful staff, superb food & wonderful atmosphere. Thank you a perfect luncheon!" "The venue, staff and location were excellent for our half day seminar. Reasonably priced and and convenient location for our half day seminar and parking is readily available. Ainsley and the staff at the Haus were polite, very easy to work with and the communication with me in the lead up to the event and on the day could not be faulted." Sarah Hills – SA Wine Industry Association Inc.
"On behalf of the Adelaide Hills Beefsteak & Burgundy Club I would like to recommend The Haus for a function. Our evening went very smoothly and there were no complaints from our members, only praise. The food was excellent, the staff helpful and courteous, and the organisation impeccable." "The Haus was an excellent choice for the Graduation Dinner for our very first group of Year 12 students. The students and teachers loved the food choices and the set up of the room. It was cosy and warm on a very wet and wild evening and we appreciated having a room just for our group. The service was seamless! We look forward to this becoming a tradition for Tyndale Christian School Murray Bridge!" "I would strongly recommend The Haus Group to small and medium sized groups who are looking for a function and accommodation venue in the Adelaide area. It's just a short drive up the freeway - and allows you to escape from the hustle and bustle of city life! The food is delicious, the venue is of a very high standard and the staff go above and beyond to ensure your event runs smoothly. You can expect exemplary service and you'll leave with a smile on your face!" "Hahndorf is a beautiful location for a conference or meeting. I found working with Alana as the one point of contact for our meeting and accommodation requirements made the whole event streamlined. We were also impressed with the level of professionalism of all staff we encountered during our stay. Thank you!" The Haus Group is owned and operated by the Duffield Family who have helped shape the tourism industry in Hahndorf for more than forty years, establishing great Adelaide Hills Hotels such as The Hahndorf Old Mill, The German Arms, & the Hahndorf Inn Hotel. More recently responsible for the Haus Restaurant, establishing boutique Hahndorf Accommodation – The Studios by Haus, The Manna by Haus and The Lodge by Haus, and the building of the Haus Conference & Events Centre. We aim to make your stay in our village rich with the finest local food, wine and beverages, and of course award-winning service. We promise that you will go home well rested and fed, with a smile upon your face.